﻿? 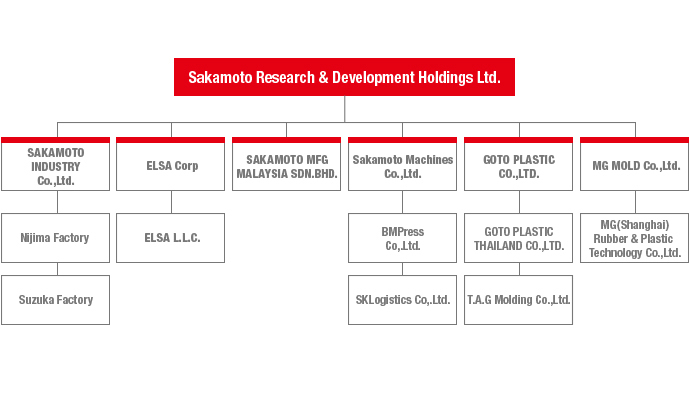 CORPORATE INFORMATION｜SRD HOLDINGS Ltd.｜SAKAMOTO INDUSTRY CO.,LTD. The car society of the future forged through creativity and innovation. ・Provide services that contribute to society through quality and technological innovation. ・Provide stable and valuable working place for employees. ・Manage systems and resources by promoting company development. Since our foundation, we have been steadily developing as an integrated manufacturer engaged in designing, evaluating and producing component with vital-safety parts and regulation parts. In the business environment surrounding the auto industry, there are many challenges, including making further environmental improvements and ensuring compliance with tougher laws. In response to this, we will further strengthen our unique technologies and core technologies of product development, production technology, and evaluation technology and, as stated in our mission statement, we will continue to strive even harder towards our aim of contributing to the community, developing human resources, and increasing the job satisfaction of our employees. We would therefore appreciate your continued support and cooperation. Research and development of intake and exhaust system and fuel-related products. Fuel tanks (metal/plastic), mufflers, exhaust pipes, air cleaners, etc.